Join Us at the Reformation of Food and the Family Conference! 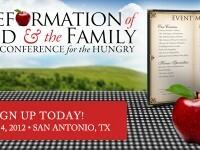 We’re very excited about the upcoming Reformation of Food and the Family Conference in San Antonio, Texas July 12-14. True Food Solutions will have a booth there and we look forward to engaging many likeminded reformers in discussions about the challenges and solutions we’re finding as we work to transition away from the modern industrial food economy to a more natural and sustainable food system. An accident reveals an early 20th century advertisement – one that says much about man’s trust in science and it’s ability to provide for health artificially. Peter Bringe, author of The Christian Philosophy of Food, tells the story and provides an analysis of the deeper issues. US Department of Labor announced Thursday that it was dropping proposed regulations of family farms related to children working on the farm. This story, and the retreat of the federal government, offers some important lessons about food freedom and what needs to be done to secure our liberty in the future. While there may be exceptions, our ‘communities’ have largely become depersonalized and non-relational. The problem is that people are still personal. We haven’t become impersonal, but how we think of people and their ideas has been corrupted. So what is the solution? And what does this have to do with food? Food has much to do with this because it is an integral part of hospitality. And hospitality is a large part of the solution to our mess. A full discussion of food will include the social-political and cultural aspects of the environment in which the food will be cultivated, harvested, prepared, and eaten. If our society and culture in general is messed up, our food’s quality will not escape unaffected. It is good for us to then to examine our current system, and the centralization that accompanies it.